1 September 2018 is the date on which the Grenada Government will institute its ban on the importation of Styrofoam. The ban on importation is the first in a phased approach to the eradication of Styrofoam and reduction of single-use plastics, in keeping with the Non-Biodegradable Waste Control Act which was passed in both Houses of Parliament this year. The second phase will be a ban on the sale of Styrofoam in the tri-island state effective 1 March 2019, and by 1 April 2019 to prohibit the sale and offer for sale of food in or with these products. 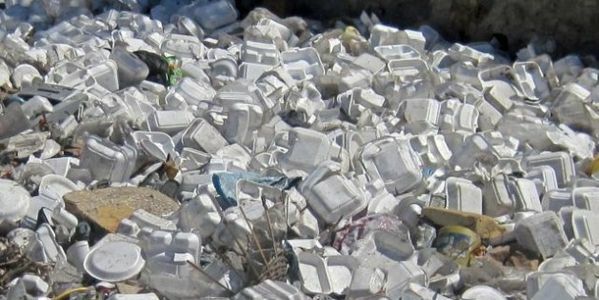 Ultimately, there should be “ZERO STYROFOAM” across Grenada, Carriacou and Petite Martinique. Minister for Climate Resilience and the Environment, Senator Simon Stiell made the pronouncements during government’s weekly Post Cabinet Media Briefing on Tuesday, 28 August. He noted that the ban is not being instituted arbitrarily, but in consultation with importers and other stakeholders. He further stated that government is committed to working together with stakeholders to ensure that the transition and economic impact of the ban on Styrofoam and specified single-use plastics are as seamless as possible. Minister Stiell describes the Non-Biodegradable Waste Control Act as “progressive legislation” which seeks to regulate the use of non-biodegradable products, with a view to reducing the negative environmental impacts and improving the health of Grenadians. The legislation also places a ban on single-use handled shopping bags; the importation ban on these bags will come into effect on 1 February 2019 and by 1 February 2020, no more of those bags should be available in Grenada. The ban on other single-use plastics, such as cutlery, plates and cups, is also due to come into force on 1 February 2019 but there is the need for further consultation with stakeholders before the order for this ban is signed, allowing the law to go into effect.